Duncan Charman’s Weekly Session Report – Friday 27th July. Although l don’t receive as much information as l used to, when news comes through that a water close to my home has been producing some big crucians, and by big l mean in excess of 3lb, l will always follow these up, albeit sometimes not as quickly as l should. Today’s session was going to be one of those rare occasions when time allows for such an opportunist occasion and with my day ticket purchased l headed to the Hants, West Sussex border with expectations. With crucians in mind l could have taken the float gear but knowing the venue contains loads of quality roach, knew these would be a problem, especially with a bait falling through the water, so opted for a very effective crucian tactic, the method-lead. Having major car problems l managed to scrounge a lift from my dad and after picking up the girlfriend’s father on route we arrived in the early hours and set up along a bank that had been producing. Tackle for the session consisted of a Korum Neoteric XS Multi Feeder Rod with the 1.5lb tip added, CS4000 Reel loaded with 6lb mainline and on the business end ran a 1.1oz K Grip Inline Lead buffeted by a Quickchange Bead which had a 5lb four-inch hooklink along with a size 16 barbless PR36. Bait was simply either a piece of corn or 8mm S-Pellet that would be hair-rigged along with a good helping of sieved Sonubaits Super Crush Green squeezed around the lead. Bites came immediately from quality roach, making the corn almost impossible to use, however the 8mm pellet slowed these down and it wasn’t long before l found myself locked in battle with a big carp. Playing this within the swim probably did me some good, as after she was landed the roach seemed to disappear and other species started to show including tench to around four pound plus my intended quarry. Well not quite my intended quarry as although l would love to say they were crucians, the shape, colour and general appearance bared very little resemblance to a true crucian. If it was just one of these that l took then l could have said that it was a one off, however a few fell to the three of us, and all looked the same. It was a really relaxing morning spent in great company on a really great fishery, and the big carp that came along was a real bonus and proof of what can be taken on balanced tackle. With this fishery knocked of the list as a potential crucian water l headed home, yet on the way stopped of at another mature commercial, this time to check out its perch potential. After a quick chat with the owner, who confirmed that a specimen perch had been netted and returned a few weeks ago, another mental note was placed in the old grey matter, one that l will act on once the cold weather arrives. Learning by our mistakes. Thursday 19th July 2012. Last year l had a hunch that a day ticket water in West Sussex might just throw up a few monster eels and a single overnighter back then produced four eels, including two fours. I was eager to return and with the weather taking a turn for the better, along with a spare night available, headed back full of expectation. I had spent hours making sure that everything was in order and as l cast out in the same swim knew that things were about to happen. The standard home made drop off indicators were set really light and as l clipped the mainline within waited for the KBI alarms to sing. Everything looked perfect, small fish dimpling the surface and an abundance of insect hovering in the humid evening air. Ten minutes past before something found my prawn hookbait to irresistible to refuse and as the clip dropped to the ground, line poured of the spool of my KZR Mini Pit 6000. Leaving the run to develop for a few seconds l finally engaged the bail arm and swept the Korum 2.75lb carp rod back, and when the rod took on a healthy curve and line started leaving the spool, due to serge forwards and a series of jagged headshakes, l knew exactly what was hooked. My huge triangular landing net takes no prisoners and in the first eel of the night slipped, a specimen weighing 4lb 4oz. Over the next hour three more runs were encountered and considering it wasn’t yet dark l had high hopes that this was to be the eel night l had dreamt of, especially as one of the runs produced another big eel, this time 5lb 5oz. The action slowed after dark, however at 1.30am the swim came to life again, however disaster was looming in a way l had never experienced before. As the run developed l watched as the line twisted creating a mini bird’s nest, before jamming one of the rod eyes, causing resistance and resulting in the run to be aborted. Thinking it was a one of l recast only to witness a repeat performance occur moments later. Knowing these runs were from big eels l decided to sit next to the rods and as the line pulled from the clip, grab it and feed it slowly of in the hope that it wouldn’t twist, however this practice failed. Next option was to set the clutch as light as possible, however the next run was aborted soon after taking off, as was the next. All the runs were coming of one rod cast to my left so l decided to switch my rods over, this seemed to work as the next run saw a hooked eel, yet moments later the hook pulled. Another run was soon happening but amazingly l watched as this line coiled, twisted then jammed in an eye. Desperate at landing another and with the skies beginning to lighten l even tried striking immediately, yet this failed. Stripping yards of line of each reel, l recast both to the left and as the next run developed struck momentarily feeling a fish before the line parted. I can only assume that either the line twisted creating a weakness or it caught one of the eyes, whatever it was it signalled the end of a very frustrating night, which really should have been a red-letter session. Amazingly the line was relatively new, used only a couple of times without any problems. I can only assume that either l had purchased a bad spool of line or when l had used it before, whatever it was l was doing had stretched and weakened it, however whenever it was, when part of my tackle lets me down l never use it again and as soon as l got home l binned the line, replacing it with a braided version. I just hope that this wont let me down when l return very soon. Buy your husband a days fishing! This weekend was a long one. Saturday morning the alarm awoke me at 3.30am and come 4.15am l was in the car heading north to Cudmore Fisheries in Staffordshire. After a journey not far short of 200miles l finally arrived, after a good run, at around 6.30am and set up on Milo Lake where l would be showing anglers of all ages and abilities some of my favourite big fish tactics. The weekend was really all about getting youngsters hooked on fishing and introducing them to Club Korum and with some big names walking around such as Tommy Pickering and Nigel Botherway everything was planned to create a great weekend for them. I had taken a look on Cudmores website prior to leaving and it stated the lake produced huge bags of chub and barbel and having never fished for either in a stillwater before was looking forward to the experience, especially the chub fishing. The weather was unsettled on Saturday, yet with fish rolling along our allocated bank l rubbed my hands, imagining a big bag of chub come the end of the day, all caught on one of my favourite methods, the waggler and sprayed maggots. With a gallon at my disposal the pole elastic started stretching yet after three hours not one chub showed, just bream that were feeding two feet down in ten feet of water! The method was abandoned and l set up two rods with the groundbait lead with short hooklinks, identical to the ones l use for crucian carp and swung these out. Although the fishing wasn’t hectic, action came all day from small carp, tench, bream and one barbel, my first from a stillwater. Loads of anglers helped themselves to a run or two and a great day was had by all, including Des Ship and Lee Kerry who were set up next door and demonstrating pole tactics. Day two l set up in a new swim with open water to cast at and opted for two different methods. The first was the helicopter rig with maggot on the hook, the other the pellet lead with an 8mm S-Pellet on the hook. It was obvious that the fishing was going to be better today as numerous carp, bream and barbel fell mainly to the pellet with more silvers coming to the maggot, including the only chub caught throughout the two days. It was a really great day with no rain for once and with loads of kids passing by and grabbing my rods as the ripped of and landing personal bests, including the best fish of the weekend, a four pound koi landed by Nathan. 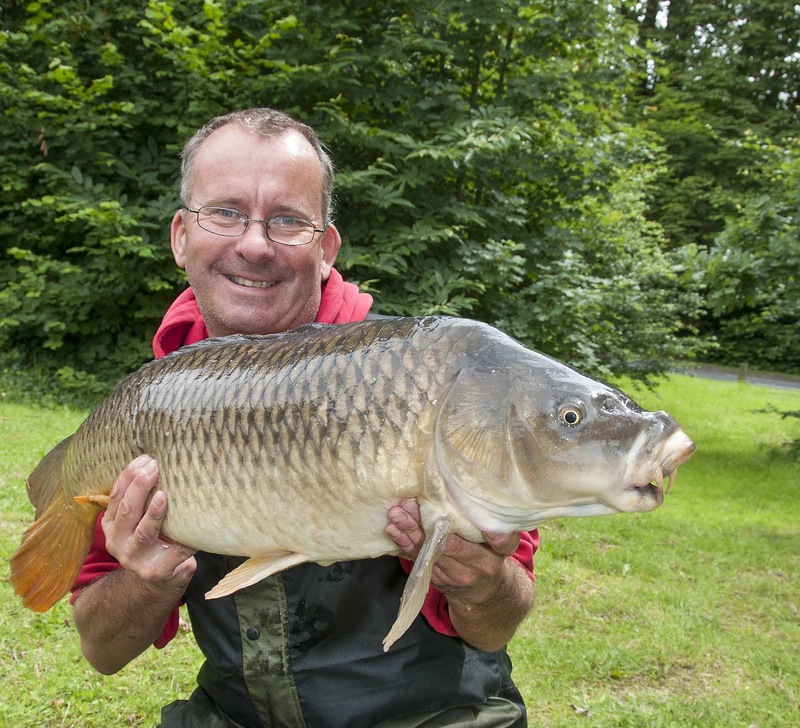 Duncan Charman’s Weekly Session Report – Thursday 12th July. Image 1 – The biggest of twenty two! Although l couldn’t concentrate fully on this week’s session, due to producing a feature at the same time for Anglers Mail, it was good to get out and fish Godalmings Broadwater Lake, a venue steeped in angling history and a serious runs water. My dad had joined me, it was the first time we had managed to get out together for ages, and with this in mind he was content with casting out PVA bags of pellets, the standard tactic for the water. However l wanted to work my swim and had decided to fish the pellet lead, casting every fifteen minutes or so. After casting out a small Spomb loaded up with scolded 2mm, 4mm, 6mm and 8mm Sonubaits pellets, l clipped up and placed a pole elastic stop knot next to the reel and repeated the process a couple more times to prime the swim. Removing this l simply tied the rig onto the mainline which consisted of a running 1.1oz Korum K Grip Inline lead and a eight inch braided hooklink containing a size 12 Xpert Power barbless hook, tied knotless knot style leaving a short hair onto which l placed an 8mm Sonubaits S-Pellet tipped of with a tiny piece of buoyant yellow corn. Repeating the process with the other rods it took no time at all to have the swim prepared and it true Broadwater style it took just a few minutes for one of my Korum Neoteric XS 12ft Twin Top Power rods with the 2.2lb tip to burst into action from a standard scrapper double common. In between photos and organising products for the photographer l was kept busy with numerous more commons, however even thou dad was casting far more frequently than most other anglers around the lake, his swim was uncharacteristically quiet. Dads set up was slightly different to mine. Apart from using PVA bags of hard feed pellets that were all somewhat smaller than his 11mm hookbait, he wasn’t to bothered about clipping up and hitting the same mark every time as in the past he still gets loads of runs, however today, the fish obviously wanted a tight bed of bait and when the rains came after just five and a half hours fishing he had landed just two carp compared to my twenty two! Id fished the same swim the day before and managed around a dozen carp in just three hours, all mirrors, so was surprised that all my fish were commons during this session, the best going 19lb 9oz. This sort of session just goes to prove that by inserting some thought and effort into your time on the bank can reward you big time, yet if your quiet happy casting PVA bags around and sitting back, well you might be waiting far longer than needed. Its been a while since myself and Jake have been out, mainly because he has been concentrating on his exams, however with these now over we have booked a few sessions over the next few weeks. With this in mind, and only having a few hours at our disposal, l felt that it would be good to take him to a runs water and where better than Broadwater. Casting out ‘the method lead’ l think it took all of six minutes before the alarm screamed and Jake found himself playing the first of maybe a dozen carp. Although Jake, like me, would rather be fishing for other species, these days are great to create confidence and learn how important it is to cast frequently and accurately, something that he can take with him when he goes bream or tench fishing. Fishing for just four hours, at the worst time of the day, ten till two, Jake thoroughly enjoyed himself, taking carp to 12lb 9oz and witnessed for himself how effort equals reward, as the most carp caught by anyone other angler on the day was five, and he had started fishing far earlier than us. Rod – Korum 2.5lb Carp Rods. Reel – KZR Mini Pit 6000. Mainline – Gardner 10lb HydroFlo. Lead – 1.1oz K Grip Inline. Hooklink – Gardner 15ln Sink braid. Hook – Size 12 barbless Korum S3. Bait – 2kg of dry Sonubaits mixed Elliptical pellets, plus 8mm S-Pellet on the hook. Today was my first time on the river bank since the season started and although it was a guiding day, l was hoping to cast a line sometime during the day. Last winter myself and Kevin had fished a half day for chub, however l knew that barbel were his target, so decided to split his birthday present, ‘a day with me’ that his wife had bought him, into two half days so he would stand a good chance of hooking one when the conditions were more favourable than a freezing winters day. Unfortunately this summer wet weather has meant that barbel can feed whenever it suits them, and predicting when these feeding times are, is almost impossible. To be honest l would have been happier arriving in low clear conditions, as then, at least l know the barbel aren’t sitting up with a full belly and lowering a tasty morsel in a known hotspot can often bring with it a reward. Today thou the river was fining down, great for roach, but not good for barbel. Meeting at 6am we tried all the known areas throughout the morning, dropping the method lead in each, yet the only bite came from, almost certainly a chub and this bite was missed as Kevin had taken his eyes of the rod top for a split second. Moving upstream into a known chub swim bought bites, yet these can be tricky to hit, and l think Kevin finally made contact on the forth attempt, albeit from one of the smaller chub in the stretch. At least it was a fish and Kevin witnessed how quick bites come in a swim after casting out as well as learning a tactic that l know will produce him a few barbel in the future. Just as we were about to call it a day, we decided to fish the top pool on the stretch. Kevin cast into the centre of the pool, an area l have caught good chub from in the past, whilst l took the tail end, an area that had been fished, but we both agreed looked unlikely to produce. Kevin never had a touch, yet after probably ten seconds l had some interest and although the bite took time to develop, landed my first fish from flowing water of the season, a chub a few ounces shy of 4lb. Barbel days on the Wye. I still have a few spaces available on the river Wye fishing for barbel and chub. The dates are – Wed 5th, 6th and 7th of September (only one space for each day) plus a day on the 11th October for two anglers. 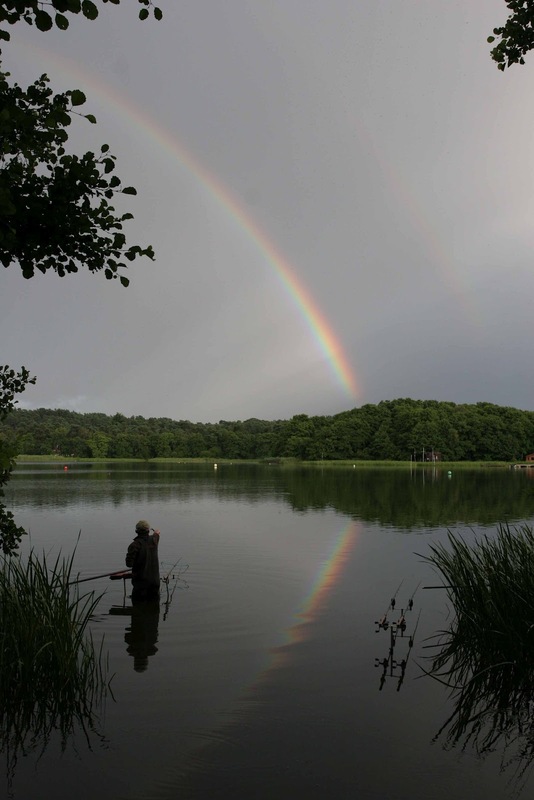 The cost of these guided days, where all bait and tackle if required will be provided, is just £125 per person. Duncan Charman’s Weekly Session Report – Friday 6th July. Having not fished for myself for over a month it was great to be back on the bank with little else entering my mind apart from catching a few fish. I could have gone for the hard option and headed to a venue with eels on my mind or the easy option and headed to Harris Lake on the Marsh Farm Complex and pulled out tench and crucians all night; however it was the lake that nestles in the sloping hills next door, Johnson’s that l finally decided on. Arriving late afternoon l managed to settle in between some other anglers and have the rods fishing come 6pm. A few fish were moving, albeit at around 30yards, and with the anglers around experiencing bites but no hook ups at this distance felt confident that the crucians would finally move in later in the evening. I normally fish the float on this venue but with heavy rain forecasted l decided to tackle the venue with more specialist rigs. My rods were Neoteric XS 12ft Multi Quivers with the 1.5lb tips added, replacements for Korums fantastic Precision Multi-Feeder, which were teamed up with the new CS3000 reels which were loaded with 7lb Reflo Direct Mono, a low stretch mono that would show up any movement from crucians in the swim? On the mainline l threaded a 1.1oz K Grip Inline lead which ran freely on the line and buffeted by a Quick Change Bead onto which a four inch hooklink was attached made from 6lb fluorocarbon supporting a size 16 Xpert Hook which had a tiny hair from it which would hold a cut down piece of sweetcorn. Squeezing a good helping of sieved Sonubaits Supercrush Green around the lead l simply swing this out, set the clutch and attach the bobbins. Although l wanted to sit back and relax, fishing for me is far from relaxing as l feel the need to work the swim at all times, so a routine was embedded in my brain to reload the lead and cast every twenty minutes. The first twenty passed without so much as a knock and l started to feel that the bulk of the fish were further out in the cover of the weed. Soon after a recast the clutch screamed and what was on the other end headed for the centre of the lake with myself struggling to gain any control and eventually the hook pulled. A four pound tench followed then at around 8pm the indicators started to lift and fall, a sign that the crucians had arrived. It was long after this that the indicator started to dance in familiar crucian fashion and the first of four graced my net. Unfortunately the crucians are down in weight after spawning, yet in the middle of summer last season a 4lb 8oz beauty was recorded twice, so you never know. The four crucians l landed weighed 2lb 2oz, 2lb 8oz, 2lb 13oz and the best exactly 3lb, a fish of a lifetime for many. Amazingly the action quietened down after dark with just the odd small tench falling and come 11pm when the heavens opened and having exhausted a bag of groundbait l left having taken eleven fish in total. Before anyone rushes out to buy a tin of Thomson Water Sealant to waterproof their Waders, don’t, it doesn’t work. It might be fantastic for sealing Brollies, Bivies and Ovals, but it’s a non starter for wader, so once again l had to endure an evening with wet balls whilst guiding at Frensham. Time to splash out and buy a new pair and luckily a quick call to Greys saw them agreeing to send me a pair of their best waders at half price, a payback for displaying their logo in catch pictures and articles. Frensham Great Pond can be a moody place to say the least, especially later on in the summer. It normally fishes really well for the first few weeks of the season, then as the water warms and the natural food becomes abundant the fishing slowly becomes harder, however this year l feel that we are around six weeks in arrears, and the fish, especially the rudd are very lethargic. Back to the guiding session. I was with a new customer, Lewis Deeks, a competent angler and like me one that’s been around a few years, so after fishing for the best part of five hours without the slightest of dips on either of our floats we knew that we were banging our heads against a brick wall. As l often say, if the fish aren’t feeding then it doesn’t matter what you do, you’re not going to catch them. Sometimes something is in the air which kills a lake and with very few fish showing, the lack of bubbles and a sign that I’ve learnt over the years when Frensham isn’t on par, no fish banging against my waders, we like many other anglers that were experiencing the same fate, called it a day. Something that l have always stood by since starting guiding is that if a customer finds himself fishing on such a day, when its impossible, l will reschedule, even if we have fished all day. Thursday 28th - Friday 29th June. After spending two weeks in the Dominican Republic under constant blue skies and with temperatures around 30degrees l was bought back to reality, very quickly, as just after a day of being home l found myself guiding a regular customer at Frensham Great Pond. Not knowing how it was fishing l arrived to find no other anglers on the lake and with the south west wind increasing knew straight away that the fishing may be slightly challenging. Setting up in one of my favourite swims along the bridal path l was pleased to find no weed around and when Mark arrived the camp was set for our overnight session. The plan was to fish the float into the evening darkness in the hope of a few big rudd, then get a few hours, before rising at first light to try our luck for tench. The wind made float fishing extremely difficult but Mark soon got into a routine of feeding then casting but despite fishing for the best part of six hours his efforts went without reward. I had cast an experimental sleeper rod out to the side and managed three fish, a perch, 2lb 2oz rudd along with a modest tench. Unfortunately my waders were leaking, not slightly, but badly and so were Marks so come the time we decided to get some sleep we were both somewhat uncomfortable, yet undeterred come 4am we were back in the water, this time fishing maggot over groundbait as apposed to maggot over sprayed maggot. The sun rose and the sky turned red and it wasn’t long before the rain started, brilliant, yet the odd tench was rolling and Mark was soon christening his new rod and reel with a good tench. The wind was relentless, not easing one bit throughout the session, yet come 9am when we decided to call it a day Mark had managed a few more tench including a personal best of 6lb 6oz. The conditions were challenging to say the least, yet Mark had persisted throughout these on a method that he wanted to master, and l can truly say anyone who catches in such conditions has mastered the art of the waggler. Mark saw Frensham at its worst, conquered the conditions and an art and l hope that when he returns he will find Frensham at its best. Rod – Korum CS Series 13ft Float. Hooklink – Grand Match 4.84lb. Float – Loaded Crystal waggler. Hook – PR36 size 18. Bait – Red maggot and Sonubaits Supercrush Green. June - What's been happening? It’s only fair that l bring readers up to date with what l have been up to and apologise for the lack of blog entries. The change to the format had to be made due to web hosting problems, something that took slightly longer than l would have liked and by the time it was sorted l found myself with just a couple of days spare before flying out to the Dominican Republic for a much needed holiday. To be honest, apart from casting a line in the Caribbean Ocean on a couple of occasions, l never fished for myself in the whole of June, this was due to spending the first week, burning the midnight oil completing the bulk of the chapters for my book. Twenty nine chapters were sent to Calm Productions the day before flying out, for proof reading. Apart from the final chapter, ‘what lm up to now’ along with acknowledgements, thinking of a title and a short but detailed section on myself, every thing should be completed by the end of this month, which will allow the publishers plenty of time to get the book printed and ready for publishing later this year. As soon as l have the release date, as well as details on its launch then l will let you know. As mentioned l needed a serious holiday and spent two weeks on an all-inclusive break in the Dominican Republic. My last holiday to the Caribbean was a nightmare, as just two days in l went down with food poisoning, losing nearly two stone and still suffering for a couple of weeks when l returned home. I was somewhat apprehensive to return, but l can honestly say that it was the best holiday l have ever had. We stayed at ‘The Ocean Blue Sands Hotel’ which l highly recommend. Not only was the complex spotless and friendly, but the food, accommodation and weather fantastic, and along the way we meet some great people, a couple being anglers which l intend to meet up with soon. I did cast a line in the Caribbean, and caught, but unfortunately cant report and mega Barracuda or Jacks, just a few small fish that looked like Bone Fish but with mouths like Grayling. I might have lost nearly two stone in Cuba but l think I’ve put on two stone in the Dominican! The only down side was that just before leaving l picked up an ear infection, probably due to spending to much time in the swimming pool, so for the next week lm on penicillin to try and get this sorted. Back home it didn’t take long to feel like l needed another holiday, what with the weather, as well as the pile of paperwork that had piled up, along with a wedding photo shoot that was taken the weekend before flying out that needed completing. You will see from the blog entries that l did manage to get out to my second home, Frensham Great Pond, on a guiding night. It was far from easy but l did catch a couple of fish on a sleeper rod that my customer was happy for me to cast out. The only downside to the session was that my Waders leaked so I’ve just painted them with Thompson Water Sealant, something that l have used for years on my Oval Umbrellas, but whether it works on Waders is yet to be found out. Tonight l will know! It’s now the 5th July and l can finally see the light at the end of the tunnel, and although l still have loads to complete, l can see the light at the end of the tunnel, and intend to play catch up very soon on the fishing that l have lost.